In November of 1996, a collective effort was undertaken by a group of independent recording engineers/producers, musicians and artist to record a sampling of Chicano music from the streets of 1990's Los Angeles. 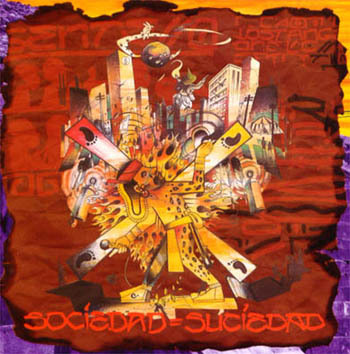 The result is a 13 song complilation album called Sociedad = Suciedad, which was released on October 21, 1997 through Big Daddy/BYO Records. The CD includes songs by five popular Latino bands: Blues Experiment, Aztlan Underground, Ollin, Quinto Sol, and Ozomatli.The concept for the project evolved out of a couple of years of musical and political interaction between the bands themselves and a group of people who share similar beliefs about the power of music to spread knowledge, express new ideas, and contest the oppressive, intolerant and anti-humanistic elements of modern society. Utilizing a range of musical styles and influence from reggae to rap, traditional mexicano to urban soul, together the 13 songs on this CD tell a complex story of rage, hope, madness and healing. In the words of the Blues Experiment,"our goal is to ride out the wave of consciousness that is spreading around the world in order to combat the ignorance that plagues the Earth." Time Stands Still-The Blues Exp. Tomorrow Never Comes-The Blues Exp.